A myTypewriter.com Exclusive! These brand new typewriter dust covers are made of quality clear vinyl and ideal for most manual portable and office-size typewriters. 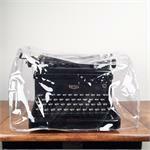 This brand new typewriter dust cover is made of quality clear vinyl and idea for most portable typewriters. Available in three different sizes (small, medium, large). This brand new typewriter dust cover is made of quality clear vinyl and ideal for most office-size typewriters.